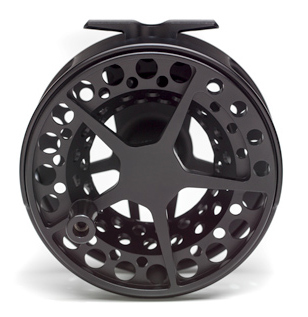 This past winter I had a chance to field test Lamson’s new spey-specific reel, the ARX. I live in the Midwest, so swinging for steelhead often means fishing in subhuman conditions or not at all. I therefore needed a dedicated workhouse, a reel’s reel, something that was not only going to heed the call, but go beyond it. The ARX fit that bill, and with grace to boot. A true performance artist, this advanced machine is a welcome addition to any spey freak’s arsenal. Let’s talk arbors. Those who’ve watched Lamson reels evolve over the years will recognize their continued obsession with making large arbors by maximizing their spools’ diameter-to-width ratio. Put simply, a large, wide spool not only increases your retrieve rate and decreases line coil memory (quite welcome if you’re shooting mono on a cold, cold day), but the wide, shallow line layer means your line radius will not change, thus your drag torque will remain constant, in the event you hook up with a backing-baring beast. On to the spey-specific portion of the program. Lamson has done everything in their power to eliminate the possibility of your shooting head or running line getting caught, snagged or fouled during any part of the casting process. They’ve engineered a full-cage frame to entirely encapsulate the spool while still allowing for palming–the bottom third of the reel is milled to exposed a portion of the actual spool. Other components, such as the reel handle and drag knob, are squatter to the reel, while at the same time being slightly oversized. This means you’ve got less possibility of fouling without compromising functionality. A tiny drag knob and tiny handle would be a big no-no for cold weather fishing. Which brings me to my next point. The ARX’s cold- and ultra cold-weather performance was exceptional. No reel is entirely immune from ice buildup when temps dip into the upper teens, but the worst I really experienced with the ARX was a light stutter–never the lockjaw that could mean a fish breaking off on the take. During one February outing I was doing a story on winter steelheading with handcrafted spey gear (even a bamboo rod), and got a chance to fish this alongside a traditional reel–which froze up so hard it had to be abandoned. The experience definitely made me appreciate how much our modern technology has widened our windows of seasonal opportunity. Many thanks, modern technology. Before signing off I’ve got to note this reel’s serious appetite for line. The 3.5+ I tested, which sits in the middle of the pack (there’s also the 3+ and 4+), eats 150 yards of 30# backing, 100 feet of .030″ running line, a 640 grain Skagit head and twelve feet of T-12. All without burp or bloating. In short, did I like this reel? I liked this reel very much. And in that it comes with Lamson’s Lifetime Warranty, it will be taming fish on Michigan’s tribs for some decades to come. 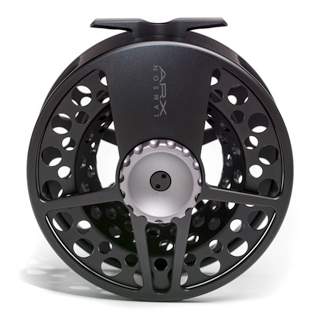 If you’re in the market for a new dedicated reel for your spey or switch rod, the ARX is worth your serious consideration.